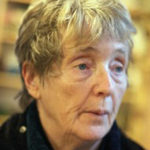 Fanny Howe is the author of more than 20 books of poetry and prose, including On the Ground (2004), Second Childhood (2014) and The Needle’s Eye (2016). In 2008 Howe won an Award in Literature from the American Academy of Arts and Letters. She also won the Ruth Lilly Poetry Prize in 2009.